For our final day of excursions the weather and the chosen locations could not have been better. The Falkland Islands offered us unusually balmy temperature, blue skies and the sun blazing all day. A typical 15-20 knot breeze blew which enabled the Blackbrowed Albatross to be out and about with their wings stretched and soaring. Our mornings visit was to Saunders Island, the 4th largest island in the Falklands lying north west of West Falkland Island. The island is run as a sheep farm and has an area of 132 square km. I felt like I was in the tropics as I wandered from the landing site over the rise to a gorgeous half-moon shaped sandy beach. Penguins played in the surf duck-diving and squabbling at the waters edge. Gangs of Rockhopper penguins came back from sea and hopped their way up the rocks and cliff edges to their crowded nest site. Amongst the nesting Rockhoppers were also Cormorants, making do living alongside their rebellious neighbors. Rockhoppers have an attitude about them simply by the way they appear. Scarlet red eyes and donned with a streak of gold on their ear crests gives them a look of mischievousness. It was the nesting Blackbrowed colony I was desperate to see, knowing that the chicks would be close to their fledging age. Both at Saunders and our afternoon landing on West Island offered us the chance to sit beside an Albatross and literally hang out for hours. Both nesting colonies required a walk along the privately owned farmland where sheep grazed. At times the walk was uphill and I realized how my cardiovascular fitness was rather poor. Sea kayaking doesn't aid you in that regard. Beth-Anne and I breathlessly paused, disguising our need to stop by taking photos, then continued on laughing at each other for our boat-bound fitness levels. You could tell we were getting close to a nesting sight because the wind increased as we made our way towards the coast that faces the prevailing winds. 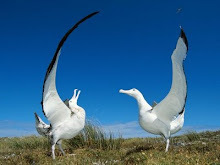 Albatross, like butterflies swarmed in the clear skies above making use of the steady 20 knot breeze. The swell broke violently along the rocky cliff bases and at times the Albatross rafted up on the waters surface in groups of 60+ utilizing a passing fish-ball. Occasionally we would hear a scuffle in the tussocks and notice that a lanky adult had just clumsily landed. It was now in search of its chick to unload the gullet-full of goodies. Once united, the chick would urgently and aggressively peck around the parents beak and you could see the adult trying to regurgitate the food on cue. The vocals had volume and the feeding would last only minutes. As abruptly as the adult arrived, it waddled to a clearing and took off directly into the wind. It really seemed as though the chicks were ready to leave home as they had out-grown their mud mound nests. Most had only patches of down remaining and during the afternoon every single one of them would take a moment to stretch its wings and flap them at a stand still as though limbering up for their first flight. It must be incredible to own such a set of wings and for an entire year be land-based. That first flight must feel sensational. 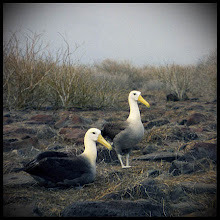 I wonder if Albatross suffer from 'first flight' nerves? 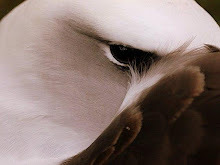 During this day there were times when I sat completely alone with an Albatross only 3 meters from where I was perched. I was able to observe them for hours and capture it on film. I realized this Plan B for our journey home turned out to be the Best Plan EVER. Traveling to Ushuaia on the Prince Albert II granted us the opportunity to visit the outer Falkland Islands, only accessible by boat and to have this chance to spend a day with the Black Browed Albatross. Strong winds are forecasted overnight and then expected to decrease for most of our full day at sea. Our ETA into Ushuaia will be in the early hours of March 26th. Wow – day by day, mile by mile, farewell after farewell, we truly are on our way home. You always said that Plan B turns out to be the best! Glad to see that you are on your way home. Safe journey.